Looking at a Painting Humanties. 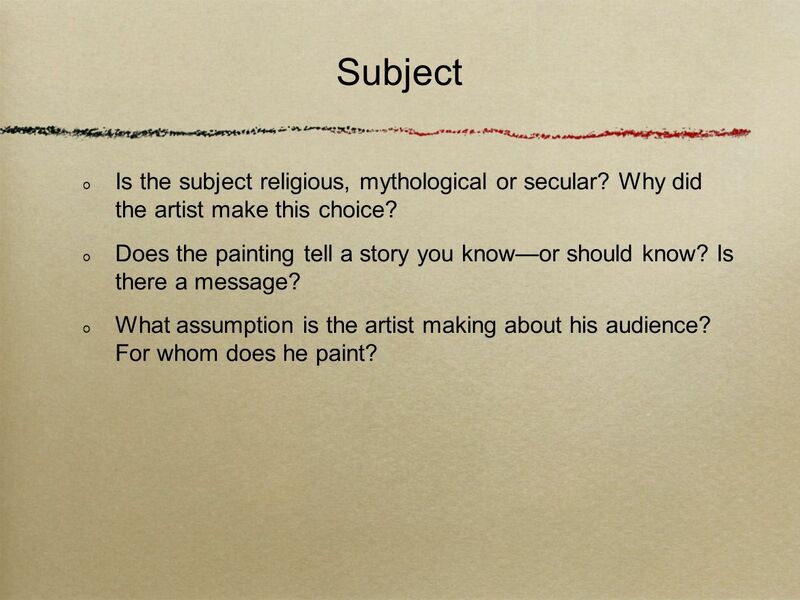 3 Subject Is the subject religious, mythological or secular? Why did the artist make this choice? Does the painting tell a story you know—or should know? Is there a message? What assumption is the artist making about his audience? For whom does he paint? 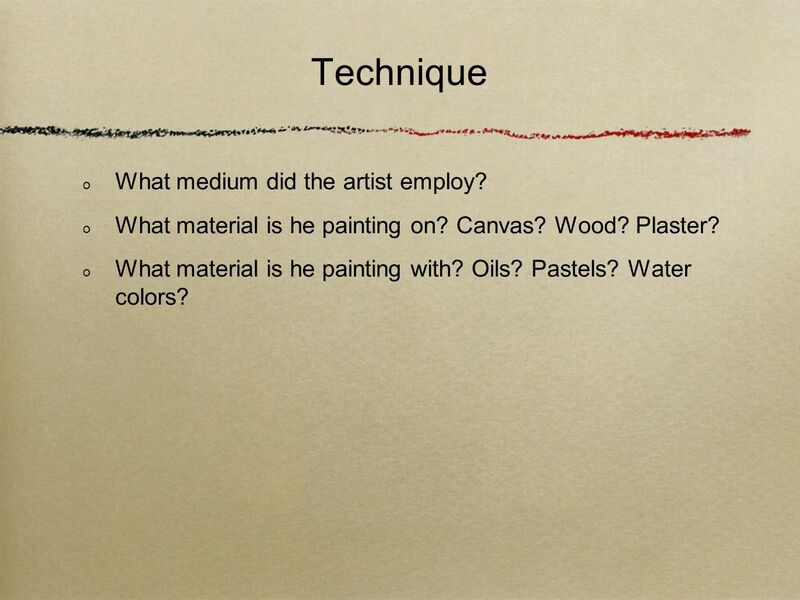 4 Technique What medium did the artist employ? What material is he painting on? Canvas? Wood? Plaster? What material is he painting with? Oils? Pastels? Water colors? 5 Symbolism Objects carry meaning. Search the whole painting for clues. 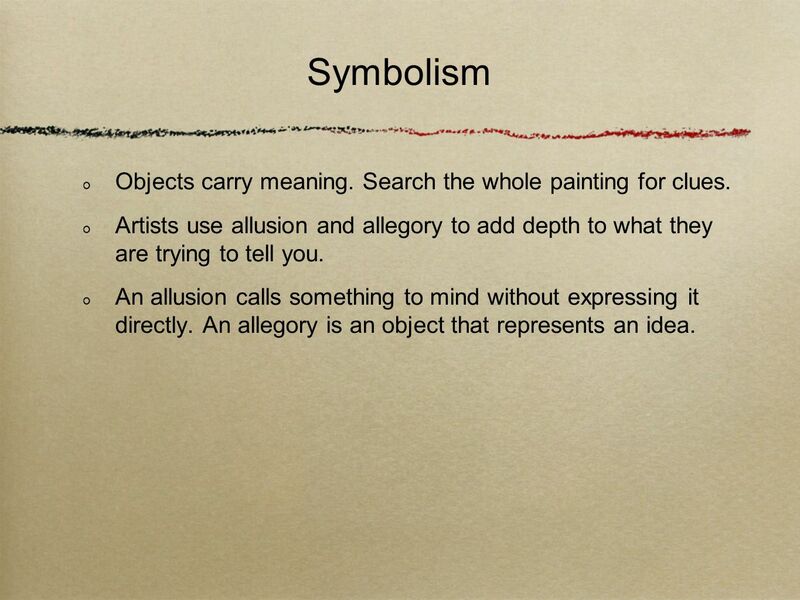 Artists use allusion and allegory to add depth to what they are trying to tell you. An allusion calls something to mind without expressing it directly. An allegory is an object that represents an idea. 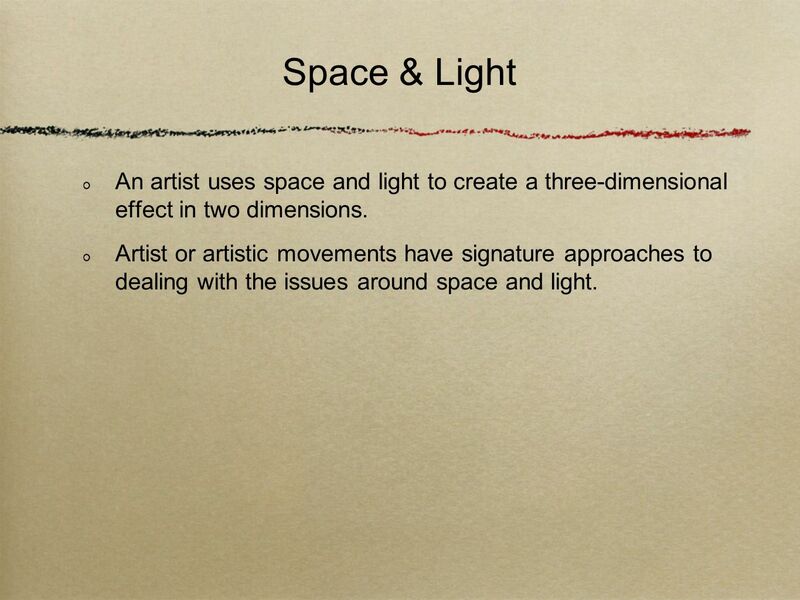 6 Space & Light An artist uses space and light to create a three-dimensional effect in two dimensions. Artist or artistic movements have signature approaches to dealing with the issues around space and light. 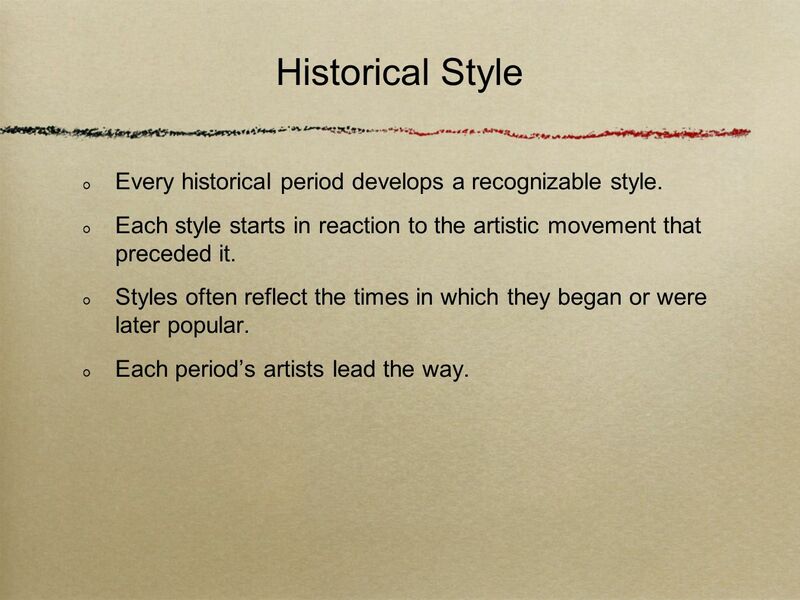 7 Historical Style Every historical period develops a recognizable style. Each style starts in reaction to the artistic movement that preceded it. Styles often reflect the times in which they began or were later popular. Each period’s artists lead the way. 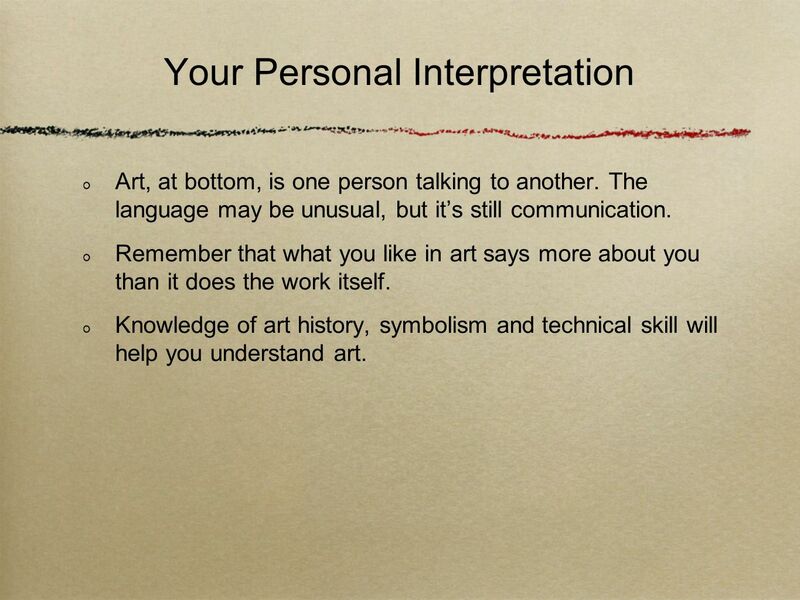 Art, at bottom, is one person talking to another. The language may be unusual, but it’s still communication. Remember that what you like in art says more about you than it does the work itself. 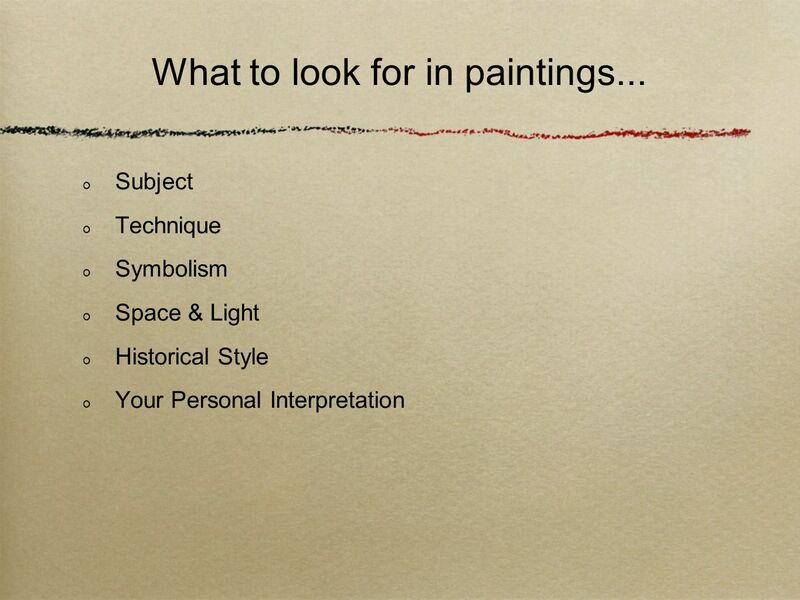 Knowledge of art history, symbolism and technical skill will help you understand art. 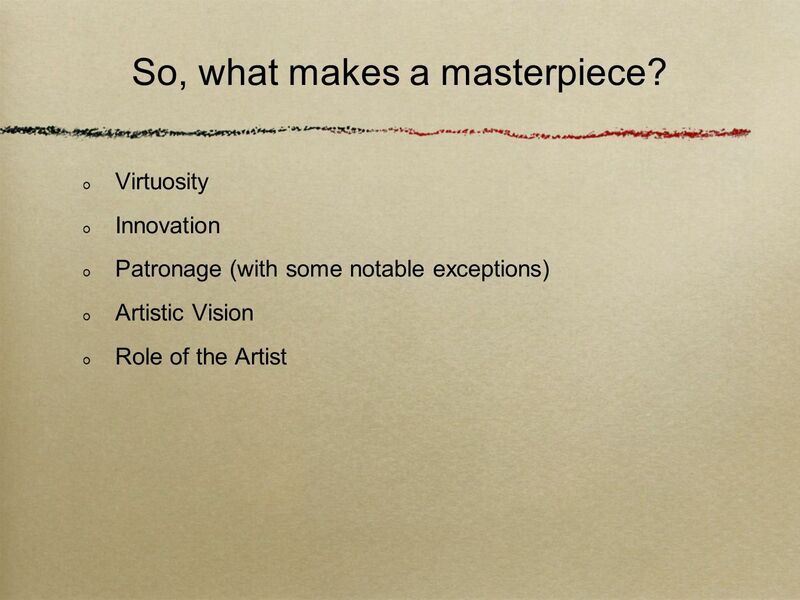 9 So, what makes a masterpiece? 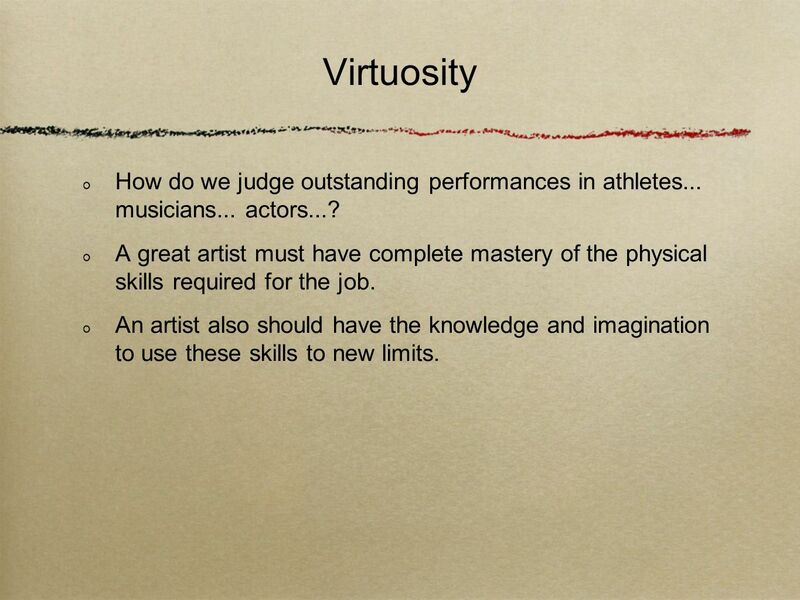 10 Virtuosity How do we judge outstanding performances in athletes... musicians... actors...? A great artist must have complete mastery of the physical skills required for the job. An artist also should have the knowledge and imagination to use these skills to new limits. 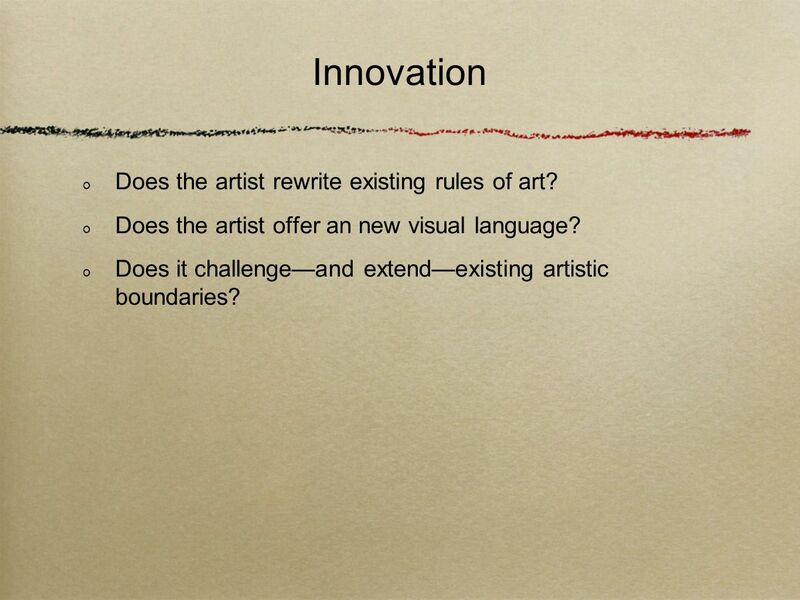 11 Innovation Does the artist rewrite existing rules of art? Does the artist offer an new visual language? Does it challenge—and extend—existing artistic boundaries? 12 Patronage Before 1800, most major works of art were commissioned by wealthy patrons. These patrons told the painter what to paint. 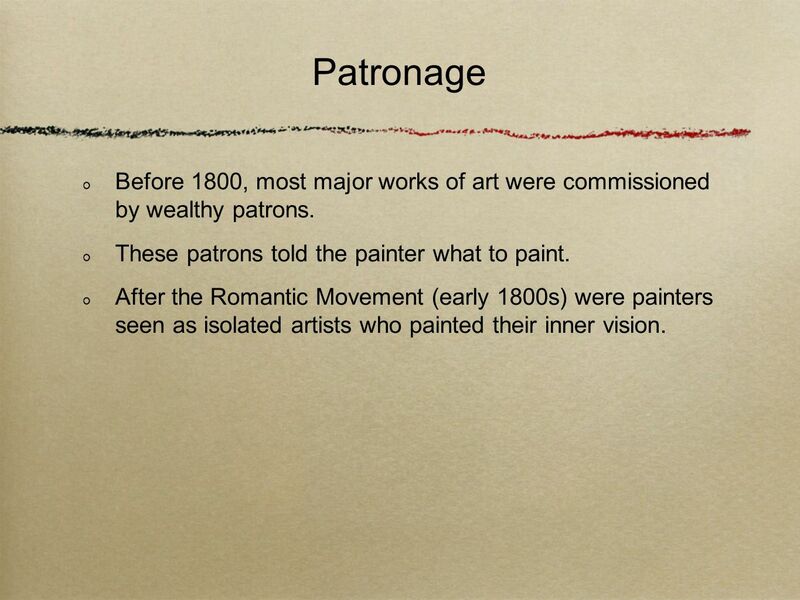 After the Romantic Movement (early 1800s) were painters seen as isolated artists who painted their inner vision. 13 Artistic Vision Great art express the artists’ total belief in, and commitment to, what their patrons ask them to paint. 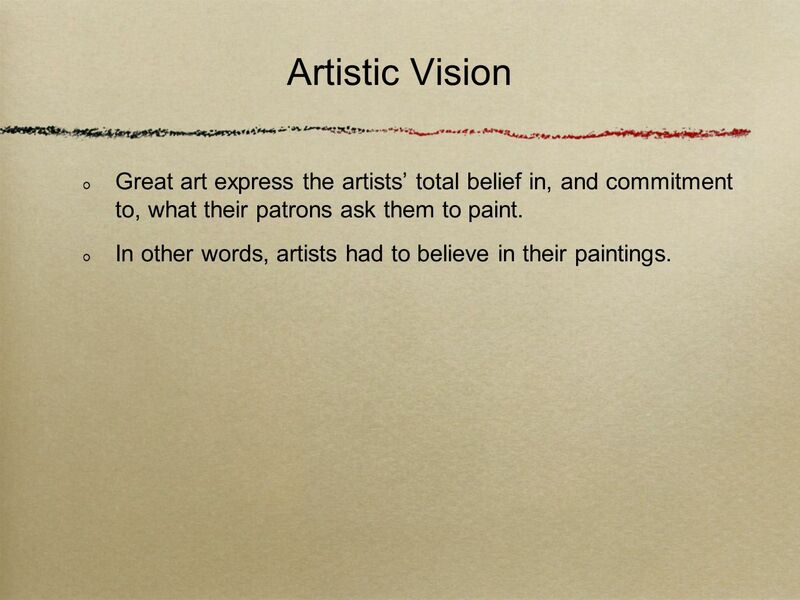 In other words, artists had to believe in their paintings. 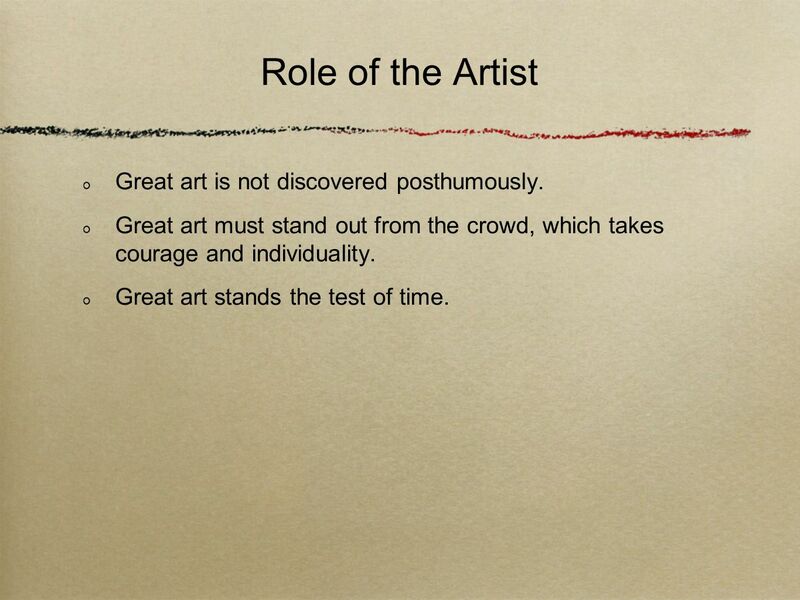 14 Role of the Artist Great art is not discovered posthumously. Great art must stand out from the crowd, which takes courage and individuality. Great art stands the test of time. 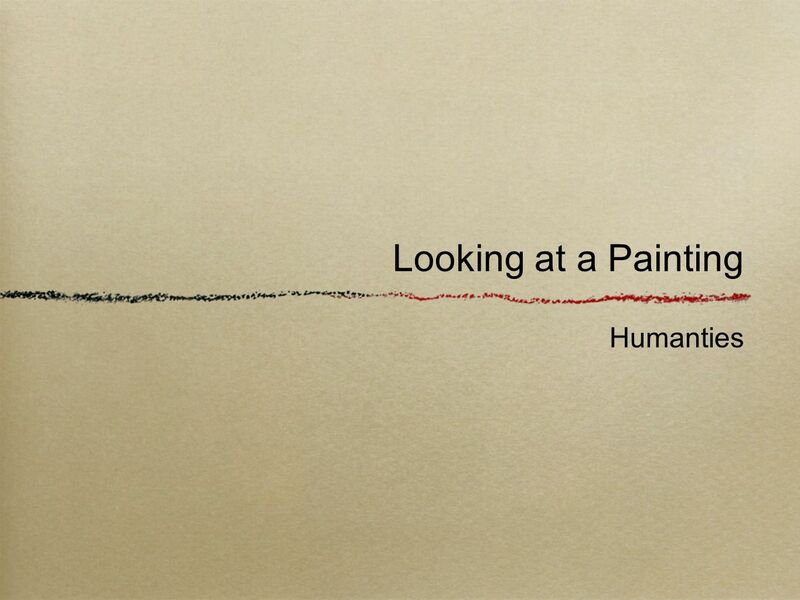 Download ppt "Looking at a Painting Humanties." Animation has applications in: Medicine Entertainment Fine Art Education Gaming industry advertising portable devices Data Visualization Technical training. Lesson Twelve Integrated Concepts Language Arts: descriptive language, setting, narrative writing, oral language Social Studies: environment, seasons. Role of an Art Historian Determine the original context of artworks. Determine why the work of art looks the way it does? Why was it even created? Just. E. Napp The Renaissance In this lesson, students will define the following terms: Renaissance Humanism Secularism Students will also be able to explain. Expressionist Painter Munich, Germany.  German born Artist  Began painting career with natural realism but then moved to experiment with more. 1. Develops ideas, plans, and produces original paintings from these content areas: observation experiences, imagination, and emotions. The Sleeping Gypsy By: Henri Rousseau Oils on Canvas. Portraiture Test STUDY FOR THE TEST USING THIS VERSION. Galaxy – Jackson Pollock. Art Art is the notion and intention of generating original ideas Art is very subjective As long as the artist has intentions. Visual Art and Design INTRODUCTION OVERVIEW INTRODUCTION OVERVIEW. Jackson Pollock was called an “action painter” because his work shows movement and rhythm. Let's Talk...In Pictures year old Spanish Cave Painting year old Hyena Cave Painting in Chauvet Pont D'Arc Cave in France. What is art history? 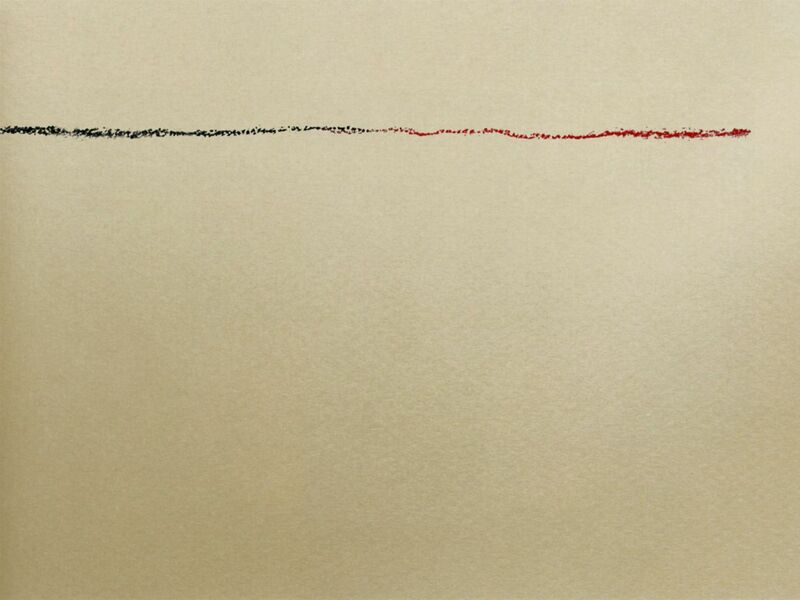 Look at and react to this artwork? While animals are attracted to superficial appearances humans are enticed by the idea of that which.